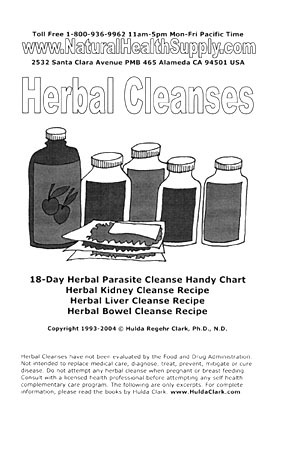 The Herbal Cleanses Recipe Booklet contains Hulda Clark's 18-day Herbal Parasite Cleanse Chart, Kidney Cleanse Recipe, Liver Cleanse Recipe, and Bowel Cleanse Recipe. The Herbal Cleanses Recipe Booklet contains the 18-day Herbal Parasite Cleanse Chart, the Kidney Cleanse Recipe, Liver Cleanse Recipe and Bowel Cleanse Recipe as excerpted from Dr. Hulda Clark's latest published work, "The Prevention of All Cancers." You may also download the Herbal Cleanses Recipe Booklet and print it from your home computer.